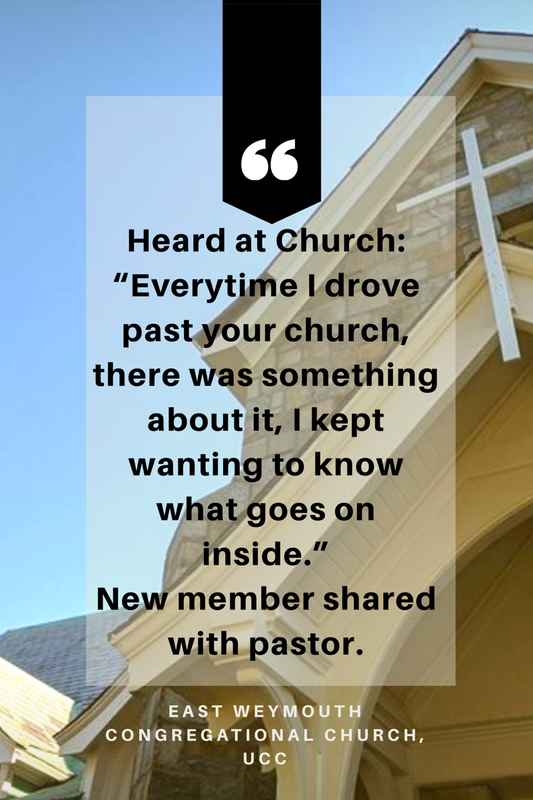 Come visit and find out what makes our church a warm, faith filled, open minded, and loving place. Opening our doors and our hearts to the wider community is very important to us. If you enter as a stranger, we hope you will feel that you can return as a friend. Are you new to the Christian faith -- wondering what it's all about? Looking for a church for your children and youth that's safe and accepting? Worried you don't know how to "do church," concerned you'll be judged. Looking for a church without dogma, where your individual conscience is valued? Check us out. Come as you are. 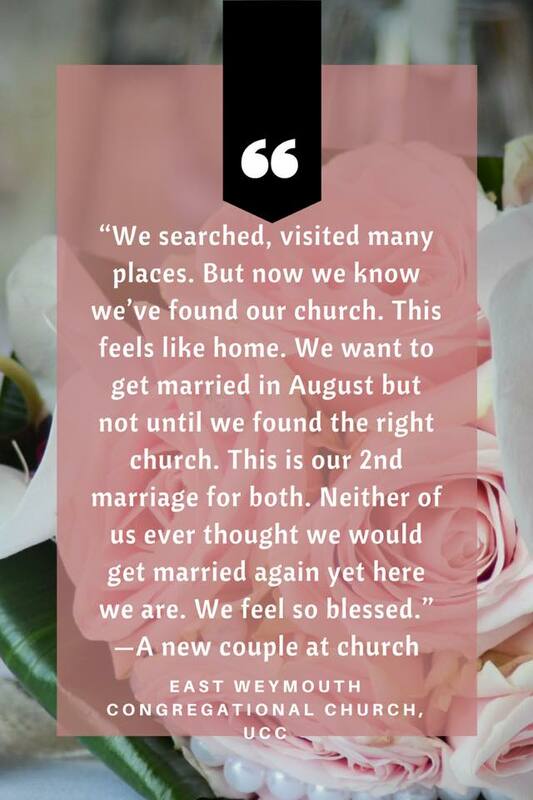 Whether you’ve never been to church before or it’s been a while and you’d like to give it a try again, you are always welcome here! 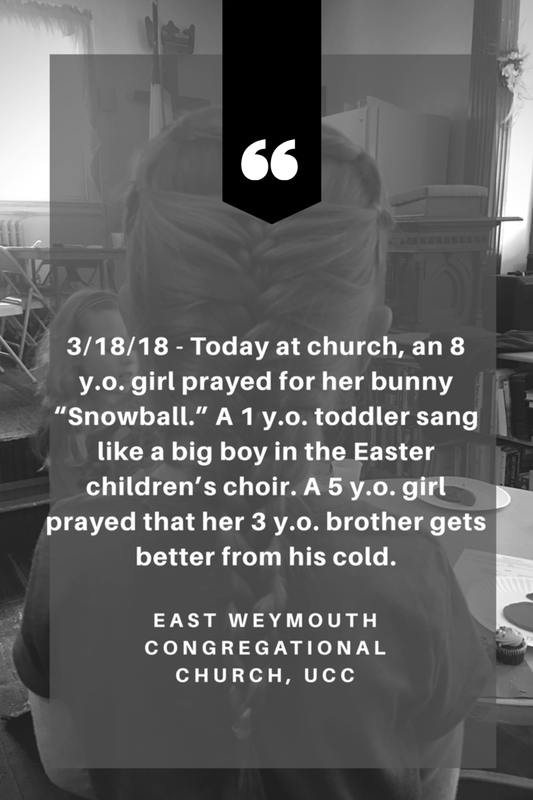 We are the little church in the heart of Jackson Square, Weymouth from the Congregational tradition of the United Church of Christ. Our Vision is to be "Rooted in God, Grounded in Christ and Growing in the Spirit." Our music director Victor DeRubeis wrote this song, It "Don't Mean That I'm Not There" for a dear friend he lost. He sings this in honor and in memory of Sgt Chesna and Vera Adams whose lives were tragically taken. We will remember and honor them forever in Weymouth. This song is also here for you if you have lost anyone dear and need to be comforted and reminded that Love never ends and is always present. 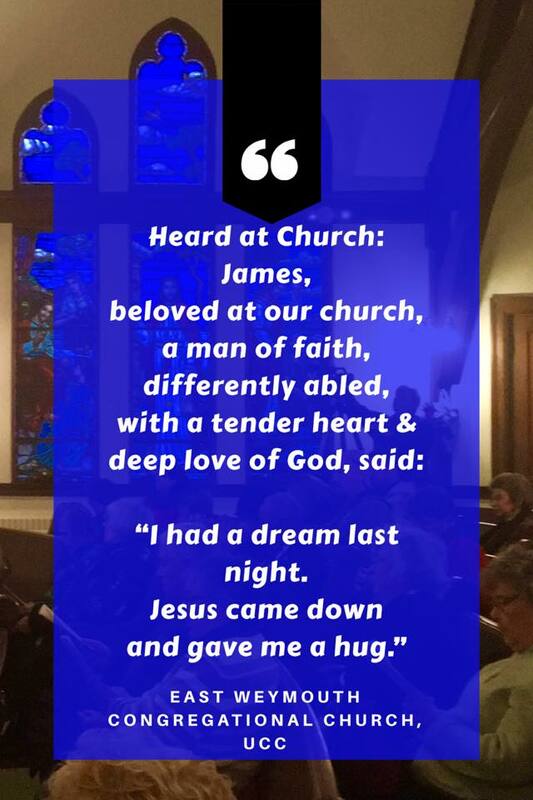 Started by the first Pilgrims and Puritans, the United Church of Christ has been the church of "firsts," weaving God’s message of hope and extravagant welcome with action for justice and peace. Together, we live out our faith in ways that effect change in our communities. 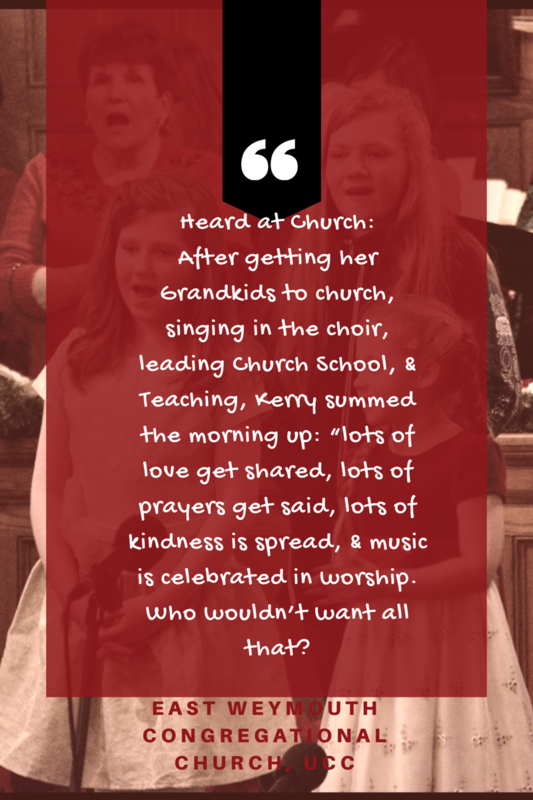 Children and Youth are the heartbeat of our congregation. We cherish their boundless energy and inspiration. Your family is welcome to join us too, from infants through highschoolers. 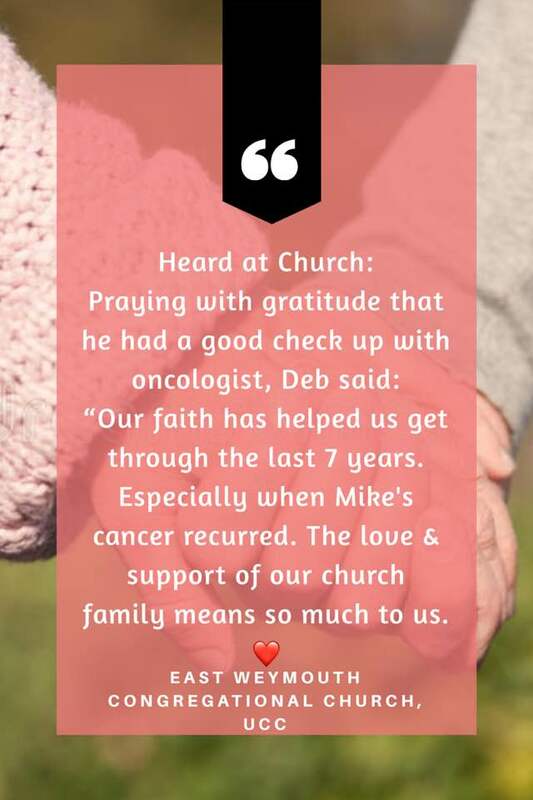 We have many opportunities for connection with the kind , faithful people of our church. Want to be in a book club? Interested in learning sacred messages of Scripture? Always wanted to craft? Want to join us in mission projects for the community? Come and explore. We have lively music that takes the best from traditional and contemporary traditions, with a 14-voice choir, soloists and instrumentalists. Our repertoire ranges from 13th century chant to 21st century jazz and gospel.